We usually focus on outdoor hydroponic content on this blog, but today I thought I would give you a peak into my indoor hydroponic basil DWC setup that I use to keep fresh basil flowing through my kitchen. 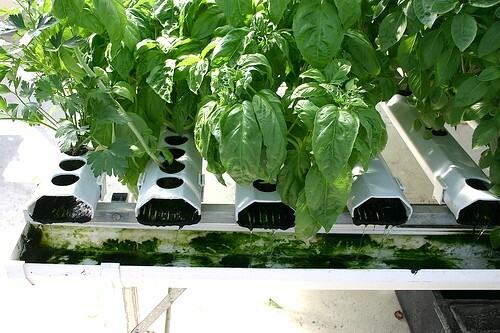 In this article I’ll show you some pics of my setup, and then give some details on the specs of the system and what methods I use to keep them producing fresh basil on a regular basis for me and my family. 1 basil clone that started in the cloner but now has it’s own 5 gallon DWC bucket to live in. Originally I had a cloner bucket I had bought and obtained some basil clones for. Once they got big enough, I didn’t know what to do with them, but since I had some spare buckets, netpots and airstones laying around I decided to give two their own homes in standalone DWC’s to see which grow better. In each bucket I am using Flora Duo from General Hydroponics at a strength of ~500ppm. (Note, the PPM doesn’t really matter, i’ve ran it from 300-1000 and it doesn’t seem to make a notable difference). The PH in each bucket is kept as close to 5.8-6.0 as I can get it. I love this stuff and it can be used for almost everything. I use it when first started my clones in the cloner bucket; no other nutrients, just some R/o water and Rapid Start. That got those roots growing quick. Once they got big enough and I transplanted into the DWC buckets, I started using my regular nutrient solution, but I still throw in a teaspoon of Rapid Start for good measure, which will aid those roots in growing down out of the netpots and into the reservoir where you want them. Another great use for these is when you are trying to start from seed. Once my seed are a few days old and I have them under the lights, I wanted them regularly with a solution of Ph adjusted water and just a hint of Rapid Start Root Enhancer. It makes them develop roots (and therefore be ready to transplant) much quicker than water alone. So this stuff is great and I would recommend it to everyone who is trying to make a root grow somewhere for any reason. It affects the PPM very little since you only use a small amount, it appears to be PH neutral, and a little bit goes a long way. The DWC buckets are the same ones I showed you how to construct in the “Build Your Own DWC System Out Of A 5 Gallon Bucket” article in the DIY section. They cost less than $20 each to make, and depending on your plant size, can be used to grow more than one plant simultaneously. In this case I only had the large netpots so I only have one basil plant per bucket, but one could easily fit five 2″ netpots on there and get 5 of these suckers going at once in a single bucket. Light Cycle: 17 hours on / 7 hours off. I tried doing it 24/7 but it started burning the leaves and the plants did not respond very well. Cooling: Desk fan that I keep on whenever the lights are on. This is so that no pockets of hot air burn the plants, as the lights are usually kept within 3-5 inches from the top of the plant and without adequate circulation the air becomes hot and stagnant which your leaves will not do well in. So there you have it, super simple to make and setup and it works great. Almost no intervention is required other than turning off the lights at night and then back on in the morning, and also changing out the water every 2 weeks. In the pictures above I had just finished harvesting some of the leaves for some Thai Basil Beef my wife was making, so if they look a little thin, that’s why. If anyone wants to see a tutorial on how to make one of these, drop a comment below and I’ll make a video tutorial for you. It’s pretty self explanatory though, the below video walk through should give you some insight into how each part works.